As a director of the Ghanaian Women’s Social Leadership Program (GWSLP) supporting Wagner Leadership in Action at NYU Wagner, how did you come to work in the leadership field and how did you come to Wagner? 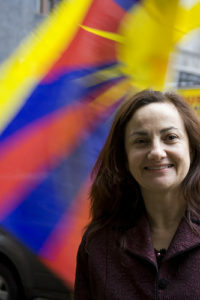 I am originally from Colombia, South America, where I studied law and political science. I came to the United States to attend graduate school in the doctoral program in sociology at NYU. I was interested in advancing research that was grounded in the community, participatory, and focused on vulnerable populations. My first full time job after graduate school was at Alianza Dominicana, a Community Based Organization that provides services to the Latino immigrant in NYC. I directed a Job Readiness Training program for People Living with HIV/AIDS. Later I joined a team from Columbia University School of Public Health as the director of the HATS program, a comprehensive HIV/AIDS research and social service intervention for People living with AIDS at the Harlem Hospital of Columbia University. My interest in social change and participatory research brought me back to Wagner/NYU in 2002. Wagner obtained support from the Ford Foundation to advance research on social change leadership in the USA. This initiative was the Leadership for a Changing World (LCW) Program. LCW aimed to better understand social change leadership in American communities and change the conversation about leadership in the USA to recognize leadership from grass roots community organizations. We were the research and documentation component of the project. For more than 7 years, using participatory research approach, grounded in organizations and the communities we worked with more than 150 leaders from 92 social change organizations. LCW yielded practical knowledge for academics and practitioners on how social change leadership happens and how organizations and leaders are able to tackle issues, engage others and obtain concrete results as they face serious constraints. Two years after the implementation of Leadership for a Changing World, the Research Center for Leadership in Action was created at Wagner, with financial support from the Ford Foundation. RCLA mission was to partner with public service leaders, organizations, and scholars across sectors to uncover new thinking about how leadership works. We explored leadership as a collective achievement. As RCLA deputy director, I managed the social change and international areas. I advanced several research, training and evaluation projects that supported women, immigrants, grass roots organizations and leaders in the USA and globally. I understand that you are the director of the Ghanaian Women’s Social Leadership Program (GWSLP) at Wagner, part of Ghana Wins!, which aims to strengthen the capacity of Ghanaian women as leaders in healthcare, education and civil society. Can you describe how the vision for GWSLP developed? The interests of the Center in leadership development combined with our interest in working internationally and focusing on women and leadership, made the development of GWSLP a natural progression. We wanted to apply the research we had done to practical leadership programs in areas that needed them. Mujeres for Africa Foundation from Spain developed the idea of starting a program on leadership in Ghana. Believing that women must play a central role in shaping the future of leadership in Africa they proposed Ghana as an ideal location. NYU’s site in Accra was a real asset. In collaboration with Mujeres for Africa, Wagner, the Nursing Department and the Steinhardt School, together we created Ghana Wins! with support from Banco Santander Foundation in 2012. Our aim was to support Ghanaian women working in civil society organizations and in the education and healthcare sectors. The need for these programs in Ghana is immense. Women still suffer terrible discrimination in society and there are very few women in high positions, even in the social change arena. 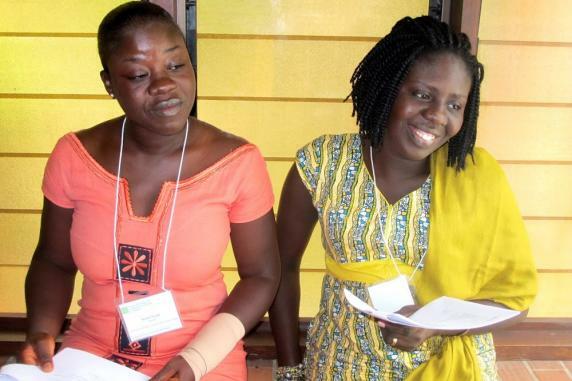 Wagner’s GWSLP offers a one-year, cohort-based leadership development program for women in mid-level positions in Ghanaian civil society organizations, offering opportunities that better enable participants to realize transformational change in their communities. What kinds of issues are program participants working on? What kinds of programming do you provide to help them realize their goals? The women who participate in the GWSLP program come from civil society organizations in Ghana that are tackling very serious issues related to social change – lack of reproductive health education and services, lack of education and leadership opportunities for women and child welfare, issues related to public health, including HIV/AIDS, lack of social services, especially for women, and lack of political participation or representation, among other issues. We target middle-level managers, specifically coordinators or managers with a high potential who need a boost so they can aspire to better positions within their organizations and help their organizations achieve their goals. Through leadership trainings, participants learn leadership skills and capabilities, enabling them to become better leaders. The training curriculum incorporates best practices and knowledge from our research from needs assessments and feedback received from women and leaders in Ghana. The GWSL program promotes a sense of collective leadership, focusing on not only in supporting the individual participants but creating opportunities for them to bring that knowledge to their organizations and communities. GWSLP so far has work and graduated two cohorts (each with 15 women who have implemented 30 Action Learning Projects in Ghana) and have recently started a new cohort of 12 women. Through the program’s leadership development, individualized coaching, and networking opportunities, participants develop the skills and support needed to lead transformational change in their communities and society at large. We challenge the idea that you are born a leader, or that leadership is a heroic or charismatic trade. For us, leadership is not a heroic act, but is a collective endeavor, which results from the capacity to build direction and commitment working with others towards a common goal. We teach that leadership skills can be developed, that anyone can be a leader, and that organizations can better achieve their goals when individuals are empowered. The program activities are both based on our research and responsive to local needs. 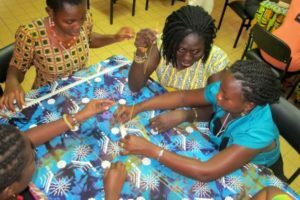 We have facilitated evaluation and assessments with women and leaders in Ghana at the start and throughout the program to better understand their specific needs and goals and assess program results. In collaboration with leaders and leadership development providers in Ghana and the USA, we run two leadership development institutes, one in Ghana at the beginning of the program and another one in NYC half way into the program Throughout the year, the participants work with coaches in Ghana to achieve specific leadership goals and advance Action Learning Projects. The coaches meet with the entire cohort of participants once a month, which is an opportunity for participants to connect, share challenges and successes, and learn from one another. The coaches are also regularly in contact with individuals between these monthly meetings. There is a fairly seamless flow of information with the participants, coaches and NYU. The flow of information and support will improve this year with our third cohort as we introduce new communications platforms to better enable direct contact between participants and NYU and build a strong network with the GWSLP alumni, collaborators and key stakeholders. We have established WhatsApp and Facebook groups, and we are developing a newsletter to highlight successes. We are now determined to advance an alumni network in Ghana and create ways to sustain GWSLP towards the future. Do GWSLP participants enter the program with a specific project in mind or is the focus more general? Participants send a proposal for the Action Learning Project (ALP) when they apply. The idea behind the projects is that it should enable them to tackle a critical need in their organizations and communities and apply what they learn through GSWLP in their communities and organizations. We work with participants to refine their projects after they have been accepted to GWSLP, and together with the coaches, we support the ALP’s implementation. We initially did not anticipate that the Action Learning Projects would become so central to the program, but most of the projects not only enable participants to practically apply the ideas and skills they are learning, but they have tackle important needs and produce impressive results in the organizations and communities. Through the projects, participants learn how to develop a theory of change and how to monitor and evaluate results. They learn how to deal with issues of strategy and management as well as deploy skills such as public speaking and team building and management. The constant feedback structure and the collaboration with other GWSLP participants and organizations are also critical to the success of the Action Learning Projects. Participants have undertaken some amazing projects. Many have been sustained after the conclusion of the GSWLP program. We have seen projects become institutionalized and participants successfully obtaining funding to continue their projects, which provides participants with greater self-confidence in addition to practical skills. Do you maintain contact with participants after the completion of the program? Yes. We remain in contact with participants from previous cohorts and are now establishing an alumni network so that these women can continue to support one another. This year, we will also have alumni from previous cohorts speak to the new participants as part of the program activities. What have been some of the best examples of change or growth that you have seen as a result of GWSLP? Our evaluations shows that after a year into the program participants learn how to move an idea to action and how to network and collaborate with others in their organizations and communities using a collective leadership approach. Participants increase their public speaking ability, their capacity to reflect and balance work and self-care. They leave with strong project management and evaluation skills, which they learn through the trainings and the ALPs implementation. The GWSLP provides multiple opportunities for participants to get to know themselves, through assessments, reflections and feedback from coaches and peers. As they complete their leadership goals and ALPs they start to see results and they feel a sense of self-efficacy and accomplishment and their self-esteem increases. By the end of the program they realize their potential, their capacity to bring change and produce results with others. They really start to feel and act as leaders. I understand that you have also researched and worked in Latin America (and of course the United States). Do you think this program is replicable elsewhere in the world? Or is Ghana especially suited to this type of program? Absolutely! This program can be replicated in Latin America and other parts of the world. I recently had the opportunity to visit Colombia, my country of origin, and travel though different regions in Peru. I found myself dreaming with the idea of implementing a similar leadership program for women in civil society organizations in Colombia and Peru. Women’s inequality and violence against women is an endemic problem in Latin America and other parts of the world. Giving women the opportunity increase leadership skills and to realize their potential would help tremendously to tackle inequality and other systemic issues. The third cohort of participants in GWSLP is just about to start. What do you see as the future of the program as the number of alumni grows and as it has a greater influence? In May we held a graduation ceremony for the 2015-2016 cohort. The ceremony also welcomed the third GWSLP cohort—12 Ghanaian women who represent civil organizations advancing human rights, youth leadership development, children rights, accountability and transparency, and women’s and girls’ rights, among other critical issues facing Ghana. As with the previous cohorts, these women will be busy in the coming year. The new participants will attend a week-long leadership development training in October 18-24. IN the summer they will come to NYC to attend a one-week leadership institute in NYC in the coming summer. After the October training, They will start to implement their Action Learning Projects throughout the year through the support of coaches who accomplished Ghanaian women leaders and feedback and support from our Wagner’s GWSLP team. The new cohort has already written proposals for their ALPs which are very meaningful. We look forward to working with this new fabulous group of Ghana women. By focusing on an alumni network, we hope to foster lasting connections among all GSWLP participants that will benefit their work on social change in Ghana. More information about the women participating in the program and their Action Learning Projects can be found on our website (http://wagner.nyu.edu/leadership/ghana). All participant bios are available here. This entry was posted in Accra, Faculty. Bookmark the permalink.